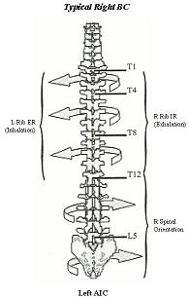 James Anderson, MPT, PRC put together a diagram that shows the influence that respiration has on rib position and spinal orientation. This handout can now be found in our Postural Respiration course when we discuss Superior T4 syndrome. To look at this handout, click here! Take a look at the most recent picture we have taken of a classic Right TMCC pattern! Do you see what we see? Fullness and bulging of the right lateral face (zygoma region) secondary to increase of frontozygomatic angle. If you are interested to learn more about this, register for a Cervical Cranio Mandibular Restoration course here! For those of you familiar with PRI, we thought you would find this intriguing. This diagram was presented in the first course given by Ron Hruska. 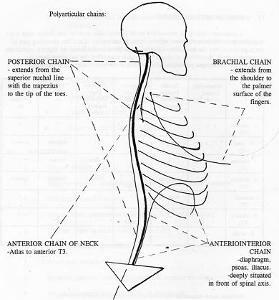 The course was given in September of 1995 and was called “Postural Reconstruction - An Integrated Approach to Treatment of Upper Half Musculoskeletal and Respiratory Dysfunction”. This is literally, the first sketch of the Left AIC, Right BC and PEC chain!